The Paris Motor Show Mondial de l’Automobile is back - and BMW will bring some exciting updates and surprises to the french capital city. Here’s the first preview! So in Paris we will see the show premieres of the new BMW 3 Series Gran Turismo and the BMW i3 with a more powerful battery and increased range. BMW Motorrad, meanwhile, is staging the world premiere of the BMW C evolution e-scooter, which likewise features a battery with higher capacity and longer range. And BMW is also using the Paris show to present its recently launched personal mobility assistant, BMW Connected. Well, we already have seen the revealing of the new BMW 3 Series Gran Turismo some month ago. But the sedan makes its show debut in Paris. Where else if not in the city, that defines trends in fashion and style? While the exterior only changed in detail, the three available petrol engines and the four-cylinder diesel in the BMW 325d are making their debuts in the new model. Inside, the new BMW 3 Series Gran Turismo creates a fine impression with features such as superior quality materials, the Navigation system Professional’s new user interface that comes straight from the luxury class and even better smartphone connectivity. In the space of just three years, the BMW 3 Series Gran Turismo has grown into an established name in the mid-size segment, with the Chinese, German and US markets as the main sales drivers. For the majority of customers, this is their first BMW. The latest variant of the BMW i3 can travel over 50 per cent further on a single charge – and it comes in new, stunning color Protonic Blue. In Paris we get to see the color on the BMW i3 the first time on the show floors. The higher storage density of the BMW i3’s new 94 Ah battery lithium ion cells gives a capacity of 33 kilowatt hours (kWh). On the standard NEDC cycle, this equates to a range of 300 kilometers (186 miles) instead of the previous 190 kilometres (118 miles) – and even in everyday use in unfavourable weather conditions that require the air conditioning or heating to be switched on, it is still capable of covering distances of up to 200 kilometres (125 miles) without recharging. 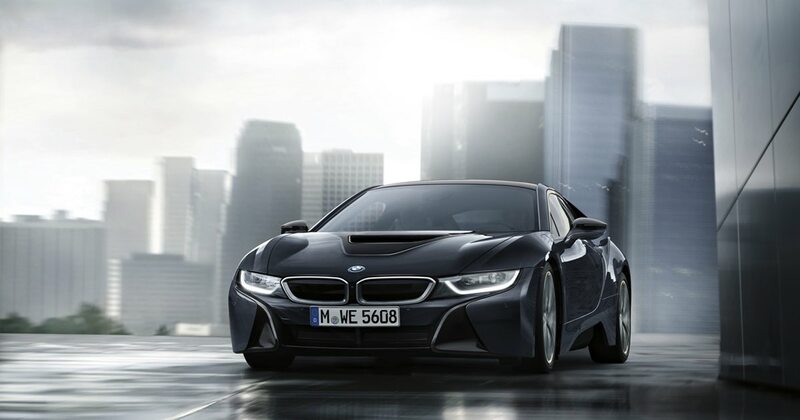 BMW is also using the Paris show to present a new and exclusive version of its i8 plug-in hybrid sports car: the BMW i8 Protonic Dark Silver Edition. The new BMW C evolution. BMW Motorrad will unveil the new electrical scooter with an extended range and new colors. The new BMW C evolution will be built in two variants – a long-range version and a European version that falls under the A1 driving license category. A new-generation battery with a cell capacity of 94 Ah, the same as that fitted in the latest BMW i3, leads to a considerable increase in the scooter’s range. The version that meets the requirements of the A1 driving licence category picks up the previous model’s range of around 100 kilometres (approx. 62 miles), while the long-range version is capable of covering up to 160 kilometres (99 miles) between charges. This provides a sound basis for zero-emissions riding combined with excellent practicality in the city and broader urban areas. Both versions of the new C evolution e-scooter are available in a new colour scheme: Ionic Silver metallic / Electric Green combined with Black Storm metallic for a contrasting effect. In addition, the centre tunnel trim of the long-range variant is emblazoned with a new graphic. BMW has been connecting driver and vehicle for years now courtesy of ConnectedDrive. And this August BMW Connected was launched, presenting customers with an all-encompassing digital concept that provides a seamless support tool for all aspects of personal mobility. Using a flexible platform called Open Mobility Cloud as a basis, BMW Connected seamlessly integrates the vehicle and multiple touchpoints, such as an iPhone, Apple Watch or even Amazon’s Alexa into the user’s digital life. The launch version of BMW Connected focuses first and foremost on journey management for the vehicle, featuring digital products and services designed to simplify, above all, the day-to-day planning of driving routes and appointments. BMW Connected thereby helps users get to their destination on time and without any stress. That’s actually not all we’ll see at the Paris Motor Show! We can not tell you all at the moment – so stay tuned and follow the BMW MOTOR SHOW BLOG, we will cover the whole show live and bring you tons of info and photos. The Paris Motor Show will be held from 1 – 16 October 2016, while the press days will be on 29th and 30th of September. Expect the BMW MOTOR SHOW BLOG to bring you lots of news and photos live from the floors of the Paris Expo at the Porte de Versailles.